Marine Forces Reserve is the largest command in the Marine Corps. With roughly 40,000 Selected Marine Corps Reserve Marines spread over 183 sites, MARFORRES is successful in training those Marines as well as the active component Marines stationed there. According to Manpower and Reserve Affairs, in fiscal year 2011, more than 10,000 Marines were trained in the Marine Corps Martial Arts Program by 236 MARFORRES instructors. With the challenging yet limited training opportunities, only few receive a chance to join the elite group of instructors by completing a MCMAP instructor course lead by a certified martial arts instructor-trainer. This year, a group of 10 instructors-in-training, most stationed around Louisiana and one out of I&I station Puerto Rico, underwent one final rigorous event here, Sept. 14, before earning the title of MCMAP instructor. 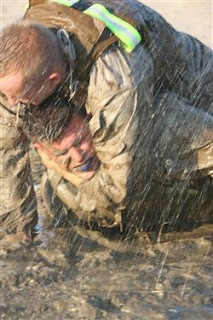 Marine Corps Order 1500.59 states MCMAP as a synergy of mental, character and physical disciplines across the full spectrum of violence. The students here spent three weeks learning about those disciplines, the obedience and higher standards that MCMAP instructors hold themselves to, said Sgt. Jose M. Galvan, MCMAP chief instructor from Headquarters Battalion, MARFORRES. They learned each teaching technique and its safeties, studied each tie-in (the mental and character discipline lessons taught to students) and rehearsed each step of the EDIP (Explain, Demonstrate, Imitate, Practice) process that instructors use to teach their students. At the end of the cycle the students took two written tests and six different evaluations on such things as their proficiency in tan, grey and green belts of MCMAP. After that the students were ready to take on the final event. Beginning at 5 a.m., the instructors split the students into two squads and drove them out into the dark forest where they began a one-mile run with flak jackets, Kevlar helmets, rifles and 60 pounds in the packs on their backs. The sweat dripped down their faces as their movements began to slow. The fatigue became very evident as they low-crawled up and down the foggy hills at the next station. 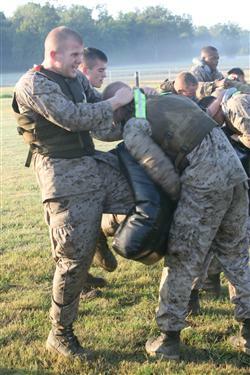 As the students traveled more than six miles on base, they stopped at a number of stations and performed different drills. Most of the stations consisted of some type of fighting exercise. Students either grappled or practiced previous techniques they had been taught. Meanwhile, other students performed movement-to-contact exercises where they engage a simulated enemy. Other times, they performed conditioning exercises such as pushups, planks, mountain climbers and burpees. 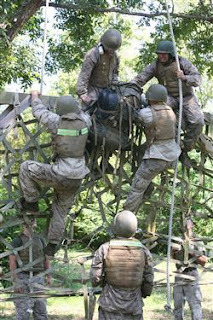 Throughout the event they struggled through the obstacles together to complete the mission. A team could not move on at any point without having all its members finished the assigned task. The camaraderie they build during this course has carried them through this event. As they grew closer as Marines and MCMAP instructors, now they will have to go out in their separate ways to their different duty stations of MARFORRES where they will be able to train more Marines. Marine Corps Support Facility schedules one annual instructor course here while hosting ongoing courses for all belts. The next instructor course is scheduled for Jan. 2012. 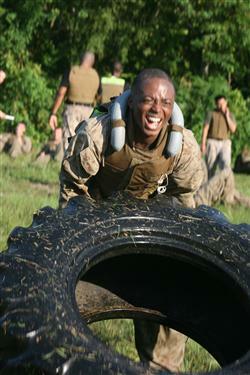 Marines who want to attend should request within their chain of command or their station’s training representative. Reserve Marines can also inquire to train at the Martial Arts Center for Excellence at Raider Hall aboard Marine Corps Base Quantico.